Please note: Vacu-Blot is discontinued. Accessories are yet available. Transfer of nucleic acids to membranes during Southern or Northern analysis was traditionally done by capillary blotting, a time-consuming procedure that usually takes up to 12 hours. 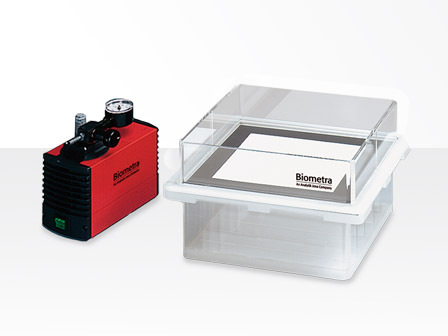 With vacuum blotting, transfer times can be reduced to 15 – 60 minutes, depending on the size of the DNA. The Vacu-Blot is built for long life. It features a solid and durable construction made of acrylic glass. A reliable sealing system guarantees fast and efficient transfer on the whole gel. The large tank allows easy recycling of buffer and protects the pump from buffer aspiration. Therefore no additional separator or trapping bottle (e. g. Woulff’s bottle) is required for use as necessary with other brands of vacuum blotting systems. The Vacu-Blot was designed for maximum flexibility. The rubber gaskets (rubber sheets) can be cut to accept gels of all thicknesses and sizes up to 20 cm x 20 cm. Vacuum should never be more than 50 mbar – 100 mbar below ambient pressure to prevent gel torsion and reduced transfer efficiency. The use of model MP86 vacuum pump (included in the Vacu-Blot System) is recommended as this pump offers controlled and adjustable vacuum. 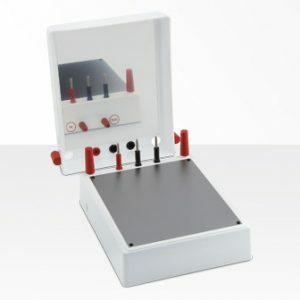 Vacuum blotting guarantees reproducible blotting results. 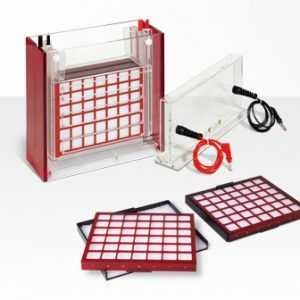 Compared to traditional transfer methods vacuum blotting offers increased transfer effi ciency and allows the detection of low amounts of DNA during hybridisation.